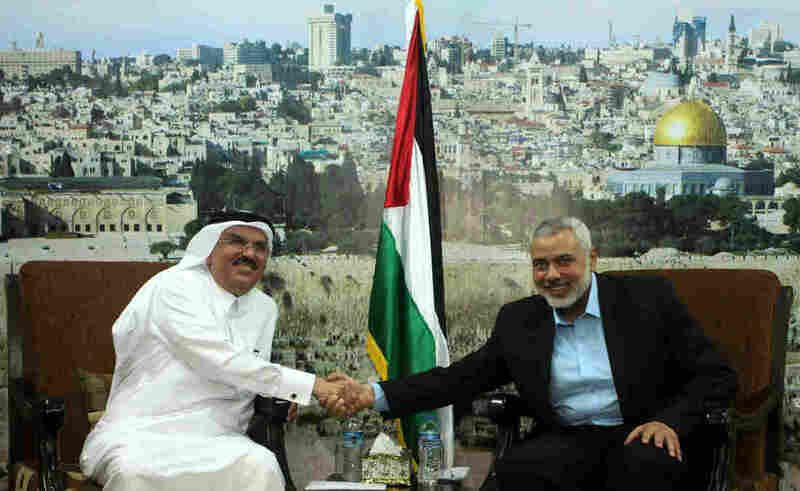 Why Israel Lets Qatar Give Millions To Hamas : Parallels Israel's long-standing policy has been to isolate Hamas. But in a rare exception, Israel does permit Qatar to send large sums of money for projects in Gaza, the territory run by Hamas. Qatari official Mohammed al-Emadi (left) visits Hamas leader Ismail Haniyeh in Gaza City on March 12. Israel has accused Qatar of financing Hamas weaponry but still allows Qatar to spends millions in Gaza on aid and development projects. This is a story about Middle East cooperation that seems to defy all the rules. Israel's long-standing policy has been to isolate Hamas, the Islamist group that dominates the Gaza Strip. And Israel has long accused Qatar of financing Hamas, including providing money used for rockets fired into Israel during last summer's war. So why, then, would Israel permit a Qatari official to visit Gaza and spend tens of millions of dollars in the coastal territory? The official is Mohammad al-Emadi, and he says Qatar is using the money in Gaza to help the Palestinian people, not Hamas. But if you want to help Gaza, he says, Hamas is your best contact. "You have to support them. You don't like them, don't like them. But they control the country, you know," Emadi said during a visit to Gaza. On a recent trip, he traveled between Israel, the West Bank and Gaza to talk about badly needed reconstruction projects, including 1,000 new homes. Gaza, which was already extremely poor, suffered massive damage during seven weeks of intensive fighting last summer. In Israel, Emadi met with business people and with the Israeli brigadier general in charge of permitting goods and people in and out of Gaza. Emadi had just left that meeting when a rocket fired from Gaza landed in southern Israel. Emadi says he immediately called his contacts in Gaza to see if Hamas had launched it. "I called these people. I told them, 'You are crazy.' They said, 'No, no, it's not us.' And they control the situation. They catch the guy," he says. 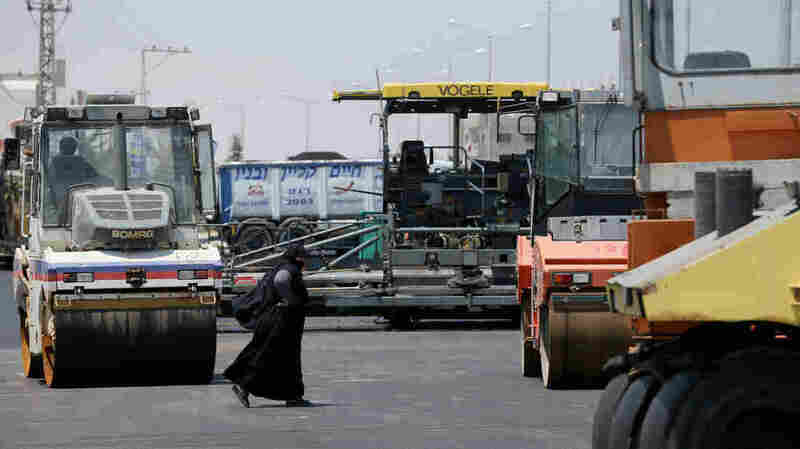 Qatar is funding multiple projects in the Gaza Strip, including a new road in Rafah, a town at the southern end of the territory that borders Egypt. Yossi Kuperwasser, former head of research for Israel's military intelligence, says that there's one good reason Israel is helping Qatar help Gaza. "Nobody else is ready to help but Qatar," he says. Kuperwasser says that because Hamas is not only a militia but also the de facto government, improving life in Gaza could deter Hamas from war. "We believe that better conditions in Gaza would lessen the incentive of Hamas and the population to go again to a war," he says. "So in a way, it is helping the deterrence. But the purpose is to improve the conditions of the people of Gaza and enable them to live a respectable life." A Hamas spokesman said Israel is facilitating Qatar mainly to deflect criticism over the war destruction and the continued restrictions on materials going into Gaza. One Israeli who knows Qatar well says aiding Qatar's work in Gaza is a new Israeli policy. "I'm very surprised. Because I don't believe that this should be the way," says Eli Avidar, who used to run an Israeli trade office in Qatar and recently published a book about that experience, called The Abyss. The trade office operated for more than a decade although Israel never had an embassy. He says after last summer's war, international pressure on Qatar grew to stop financing Hamas' armed wing. Israel's approach now undermines that, he says. "Providing the Qataris with the ability to do something like this enables the Qataris to maintain their policy that on the one hand [is] supporting terrorism and on the other hand appearing in the international community as a positive factor in the region," he says. But Ayub Carra, Israel's deputy minister for regional cooperation, takes a broader view. He says Qatar, along with Saudi Arabia and others in the Gulf, shares Israeli fears about Iran. "Most of these countries are afraid from the future with Iran," Carra says. "So we have a chance, now, to make the relationship better." Israel has talked about an alliance with Sunni Muslim nations for years. Working with Qatar, even if it benefits Hamas, is not that unusual, says Kuperwasser, the man once with Israeli military intelligence. "Life is full of contradictions and strange things," he says. And Israel's decision makes sense to Qatar's man in Gaza. Mohammad al-Emadi says Qatar's current projects here could take three or four more years.